Yogi Bhajan's Elephant Graveyard demands #IvoryCrush day! Yogi Bhajan's Elephant Graveyard demands #IvoryCrush day! Yogi Bhajan hoarded ivory tusks & ivory figurines in the thousands and now the world demands that Yogi Bhajan's estate destroy these objects of death! Yogi Bhajan's estate which is handled by 3HO Foundation, needs to have an #IvoryCrush Day like the one in Times Square on Friday. The Yogi Bhajan people need to urgently crush Yogi Bhajan's hoard of Elephant tusks and ivory figurines ASAP in order to show solidarity with the worldwide community that wants to stop the global ivory market which is responsible for the death of some 30,000 elephants a year across Africa. That’s one elephant every 15 minutes, just for their tusks! Ivory crushes put poaching syndicates on notice: We will not accept the mass slaughter of wildlife and the trade in body parts and organs for profit. The United States destroyed approximately one ton of confiscated illegal ivory, representing an estimated 60 elephants. The message was this: We will crush this trade, which is slaughtering elephants around the world, and the profits of the poachers and traffickers along with it. The global ivory market is responsible for the death of some 30,000 elephants a year across Africa. That’s one elephant every 15 minutes, just for their tusks. While it is true that most ivory processing (carving and other treatments) and consumer sales take place in Asia, it is no longer tenable for the United States to point a finger at China even as homegrown illegal markets persist in New York, Los Angeles and San Francisco. Technically, old ivory is allowed; new ivory is not. But it is nearly impossible to tell the difference between legal ivory acquired before the CITES ban in 1989 and the tusks of elephants killed by criminal syndicates that now dominate the illegal ivory trade. So it is essential that all confiscated ivory be destroyed and domestic ivory markets closed. 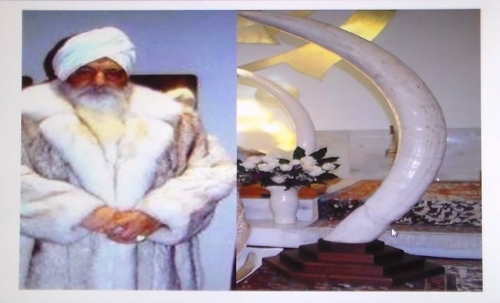 I just saw these photos of the huge ivory Elephant tusks Yogi Bhajan adorned his private Gurdwara with Hacienda De Guru Ram Das, Espanola and it reminded me of how Yogi Bhajan tried to buy as much ivory as he could in the mid 80's before it became illegal to buy and sell the tusks of elephants, In fact YB commanded me to buy and gift to him a $3,000 ivory chess set at the LA convention center gem show around 1985. I was happy to do this for YB at the time but I came to realize what a master of lies and greed Yogi Bhajan's hoarding of dead animal parts represented. Somebody says in the comments under the Ivory elephant tusk photos: "I believe the tusks are very, very old and were probably a gift from someone important. It is important to note that this Gurdwara is the one at the personal residence of Yogi Ji, not the very large one at Guru Ram Dass Ashram in Espanola, so this place is rarely open to visitors and it is even more rarely photographed. The staff on duty was generous enough to make a small exception that day. Oh, and also the late Yogi Bhajan was a former customs official so I'm pretty sure he received them in the right way. His grave reads: "Born at Zero, Died at One". I took a walk around Yogi Bhajan's 30 acre ranch where the Elephant tusks and possibly thousands of ivory figurines are stored away from the scrutiny of public view.